Collecting Piz Gloria: French Book About The Film "OHMSS"
I often receive emails from visitors to PizGloria.com and am very grateful indeed. 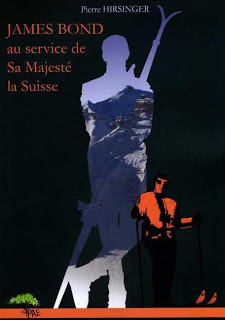 One such email I received last week was from Pierre H. It turns out Pierre wrote a book in 2009 about the release of the film "On Her Majesty's Secret Service" and in it discusses the film's strong links with Switzerland. The book is titled "James Bond au service de Sa Majeste la Suisse" and is currently only available in French. Epic, unique, singular… there are many words to describe On Her Majesty’s Secret Service, one of the most intense and original films of the James Bond movies series. Following the 40th birthday of the movie, this book is an invitation to a fascinating submersion into the heart of the Swiss Alps, to meet people who have helped the movie to become the single and lovable film it is. Through rare evidence and sometimes never-before-seen documents, the author (after 2 and a half years of passion and investigation) describes the epic of OHMSS’ Swiss shooting. You will find that the names of the heroes are not so much George Lazenby, Diana Rigg or Telly Savalas, but Annelis Stähli, Ruedi von Allmen, Heinz Brunner… and many more! While I am obviously promoting this book I do not own a copy, nor will I be receiving any kick-backs for doing so. I'm just happy to help other Bond fans, and especially more so if it's to promote a book written about Bond. For more information about this book there's a website where you can purchase it: Club James Bond France, and also Pierre has his own blog which can be found here. Hope this helps Pierre !